The Scherer Gonzalez label is again creating some buzz on the runways; ‘buzz’ that could actually tempt the bees! The bright lime green and coral colours are lovely for spring, but it’s the extreme flower encased shoes that are the real show stoppers. You'll be literally tip-toeing on the tulips with these numbers. The ultra-high heels have had the clear hollow space in the platform bases stuffed full of blossoms and petals. 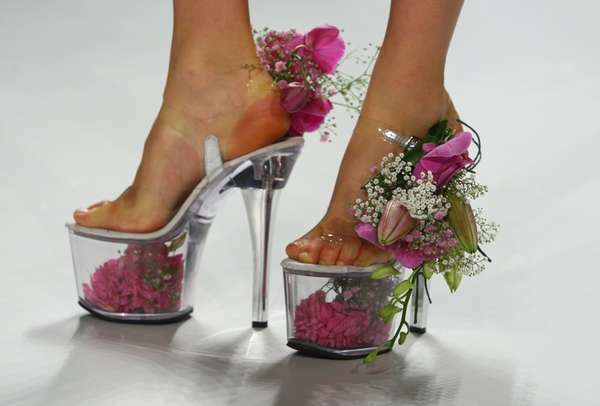 Additional fresh flower stems and leaves decorate the ankles and wrap up the models legs. I think the shoes would in fact be lovely for a wedding, if one is brave enough to be wearing shoes that high to begin with.